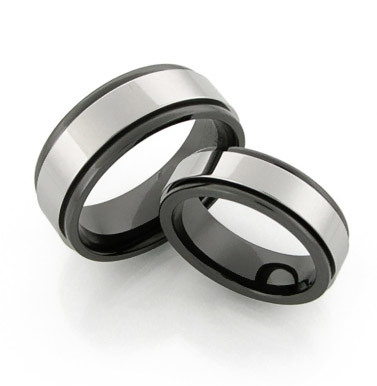 Surprise your partner with new tungsten wedding bands for an upcoming anniversary. Changing wedding rings doesn’t necessarily mean that there has been a change of heart. In fact, getting new wedding bands can symbolize the growth of a married couple together as no marriage ever stays the same. People change and grow, so why not get new wedding rings to commemorate the journey you’ve taken together? For couples who have been married for a few years, the fifth anniversary is a major event to be anticipated. Halfway into a decade of marriage, it’s only fitting to get a ring that’s both elegant and durable to celebrate their commitment to each other. Getting tungsten wedding rings as a wooden anniversary present can show just that—a lasting marriage that can withstand any ups or downs thrown its way, just like how tungsten is able to resist everyday wear and tear thanks to its amazing durability. For an even more unique gift, tungsten wedding bands with a wooden inlay for your fifth anniversary can be a stylish, one-of-a-kind gift for you and your partner. You can make it a tradition between the two of you and change the inlay of the ring through the years to celebrate that particular anniversary. To make the ring even more personal and heartfelt for your partner, you can have your wedding bands engraved for that romantic touch. Think of tungsten wedding rings as a quality investment. Thanks to the lasting qualities of tungsten, it will look and feel new for years, just like the first time it was worn. When well maintained and cared for, these rings can retain their original polish and luster for many years to come so you can enjoy them for the long run. Tungsten is an extremely hard material so it’s not vulnerable to dents or breaking. The metal is also hypoallergenic, so you and your partner don’t have to worry about skin allergies if both of you have sensitive skin. At Avant-Garde Jewelry, you can have your tungsten wedding bands customized to suit your taste. We use special laser and diamond engraving machines for customization needs. You can be assured that all of our tungsten rings are true to US ring sizing standards and are covered by a lifetime warranty and size replacement guarantee. For assistance and inquiries, contact us. We’d be happy to help and customize the perfect ring for your upcoming anniversary.